Though many people have never eaten deep-fried turkey, those in the Bayou have known for ages that this is a marvelous way to prepare a moist, flavorful bird. So if you’re looking to deep fry a turkey for a Thanksgiving dinner or any other occasion, just follow these step-by-step instructions that make learning to deep fry turkey almost as easy as making gravy. Remove the neck and giblets from the turkey cavity and rinse the inside and outside of the bird. Dry the turkey well, inside and out, with paper towels. Fold the wings of the turkey behind the bird’s shoulders and then remove the hock lock. Place turkey on a large wire rack. Place a 10- to 12-gallon stockpot on a 12-inch propane gas burner with at least 100,000 BTUs and fill with vegetable oil. 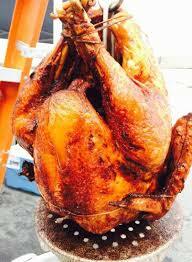 Light fire and heat oil to 390 degrees F.
Lower the well-dried turkey, breast first, into a deep-frying basket. Put on oven mitts and gently lower the basket into the oil. Lift up the turkey and dip it into the oil again three or four times so the oil adjusts to the temperature of the turkey. Fry the turkey while keeping the oil temperature as close to 365 degrees F as possible. Fry for about three and a half minutes per pound, until meat is golden and a deep-frying thermometer in the thickest part of the turkey thigh registers 175 degrees F.
Lift basket out of oil and drain turkey, including the cavity, in a roasting pan. Carve and serve after the turkey has cooled for 20 minutes.